The Rebel Sweetheart. 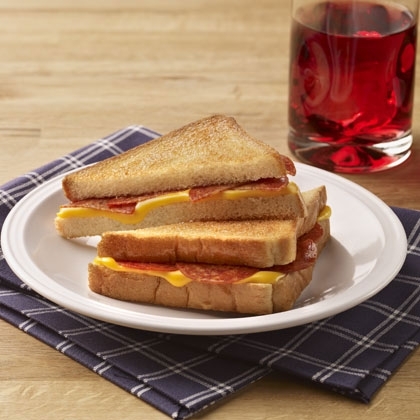 : Foodie Goodie | Grilled Cheese and Pepperoni. It's a sunny Friday morning here in the Philippines, and the little man and I just had breakfast. We had Grilled Cheese and Pepperoni this morning, a dish I learned not too long ago from Spoonful. I'm sharing the recipe with you, in case you run out of breakfast ideas and would like to try something other than your usual morning meal. 1. Divide pepperoni evenly among 6 slices bread; top each with a slice of cheese. Top with remaining 6 slices bread. 2. Heat large griddle over medium-high heat (375ºF.). 3. Meanwhile, spread top of each sandwich with butter. 4. Place sandwiches butter-side-down on hot griddle. Spread butter on top of each sandwich. Reduce heat to medium (300ºF.). 5. Brown bottom of sandwiches 2 to 3 minutes; turn sandwiches to brown other side until cheese is melted. 6. Cut each sandwich into 4 triangles. this is an easy snack to make--and yummy, too! I love eating cheese and pepperoni, but have never eaten it that way. I usually just put them in a bowl and melt then eat with a fork or put on a flour tortilla and roll up. Think I'll give this way a try! Looks like the perfect breakfast. Must try this. Perfect breakfast! Easy to make and yummy too! Grilled Cheese sandwich is my boys favorite,either for breakfast or snack. Happy Weekend and Thanks for joining!!! reason why i love grilled cheese sandwich: easy to make and inexpensive ingredients!!! It looks so easy to make and I 'm sure it's yummy too!! perfect, i have all the necessary ingredients here. thanks for sharing! I've never had a grilled cheese and pepperoni! I need to try it. It's an outside in pizza or poor man's calzone (so to speak!). This is something I think my son would love and my daughter said no when I asked her about it. This looks like a very easy recipe and kids are sure to enjoy all the gooey cheese. Thanks for sharing it! These sound yummy! I will have to try this recipe for my kids, I bet they will love it. Might even add some pizza sauce too. I love this kind of breakfast. Pretty easy to prepare and still delicious. I've never tried a grilled cheese with pepperoni, but it sounds like a great idea! My guys love pepperoni and I think this would be a hit with them! fun and easy! delicious too, am sure!